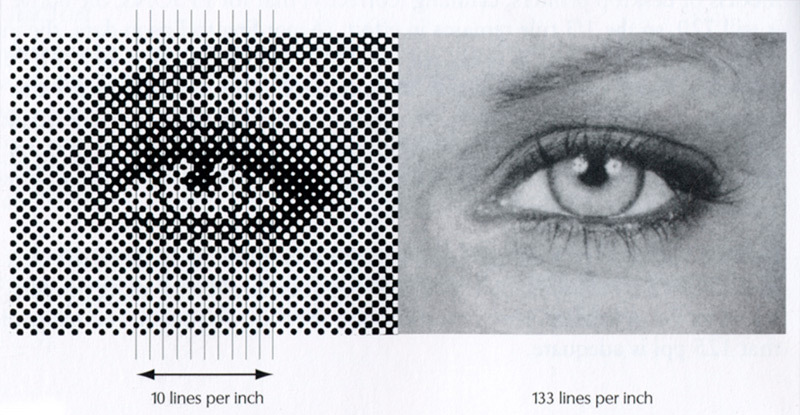 If you’ve ever looked into getting a graphics tablet then you’ve probably seen a spec called tablet resolution measured in LPI(Lines Per Inch). This sounds just vague enough to be confusing and important. So what does it actually mean? The LPI tells you how many digital lines fit into 1 inch of the tablet’s physical screen. This dates back to printing resolution where a number of halftone dots would fit inside an inch of paper and this measurement would dictate the print quality. But on a digital tablet you don’t have print lines. Instead you have resolution lines that sense the tip of your stylus while drawing. Sometimes it helps to see a visual so check out the image below from this page on DePaul University. You can see a huge difference between these two images. The 10 LPI image just looks like a series of dots while the 133 LPI image looks more like a photograph. But in the first image you can clearly see what these “lines” actually mean. So imagine your tablet has 1024 LPI resolution. This tablet would have 1024 pressure-sensitive lines squeezed into one inch of the tablet’s drawing surface. That’s a lot of lines for such a tiny space! Now in theory the higher the LPI the clearer your drawings will translate from tablet to computer. But practically speaking you only need about 1000 LPI to see high-quality results, and we can do a little math to see why. Consider the actual size of your typical stylus tip. How large is the tip of that nib’s surface? Some can be pretty large but the smallest you’ll find is 0.5mm or maybe 0.25mm. In the LPI measurement we’re looking at an imperial inch which equates to 25.4mm. If we divide this by 1000 lines we get 25.4mm / 1000 = 0.025mm per line. In English this means with a 1000 LPI tablet you’ll have one line every 2.5 micrometers. We’re getting down much smaller than a quarter millimeter per line! So even if your stylus nib is a quarter of a millimeter thick(0.25mm) it’ll still cover 10 lines even at the smallest resolution possible. You may notice a small jump in quality getting a tablet with a higher resolution around 2000 LPI. But anything above that is just for marketing and showmanship. I hope this clarifies what the LPI measurement represents and how it affects your tablet’s performance. It can be a daunting subject but it’s really a very simple concept to understand. As long as your tablet has at least a 1000 LPI resolution you’ll be good to go.